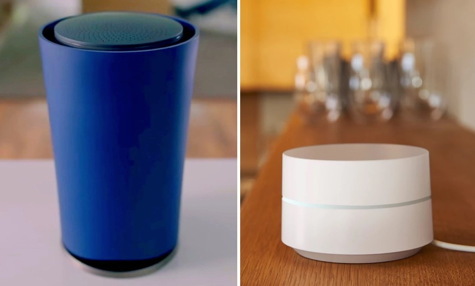 The OnHub router (left, above) was introduced in mid-2015 and we reviewed it positively at the time. It was rebranded Google Wi-Fi a year ago. Google still sells OnHub at a reduced price of $145. The new, smaller Google Wi-Fi (right, above) is the current version. 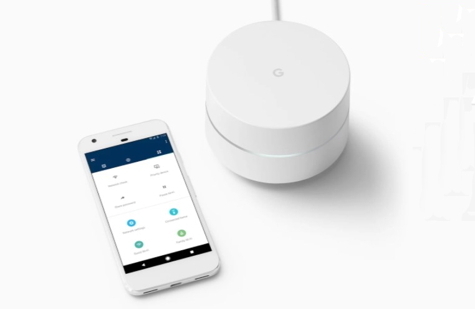 On both routers, Google keeps the software, firmware, and security settings current with updates that are performed in the background via their cloud service. You can purchase additional units that, unlike range extenders, give you broader Wi-Fi coverage via mesh capability using the same SSID. These new units are compatible with the original OnHub. They can serve as additional access points to increase coverage in larger or multi-story homes. Both devices constantly scan and automatically switch to whichever Wi-Fi band is faster (2.4GHz or 5GHz). They contain two 2 x 2 radios—two to receive signals and two to send them. Typical Wi-Fi routers don’t do this. Everything these capable routers do is managed via the Google Wi-Fi app. It has some useful tricks up its sleeve. You can host network connections for your guests and provide access to the devices you choose – a specific printer, for example. For parental control, you can grant or deny access to individual devices connected to your network. You can diagnose your ISPs speed and service. Renaming any device connected to your network is possible, and you now have full IFTTT (If This Then That) support. A year ago, Google partnered with Philips Lighting to add control of their Hue lightbulbs from the app. Current tech specs include Wireless support – IEEE 802.11a/b/g/n/ac and Wireless security – WPA3-PSK. If all of the geekery and terminology bewilders you, Dave Hamilton of The Mac Observer, has written a excellent deep-dive article on mesh networks. Switching from a typical Wi-Fi router to a mesh network system can be costly, but the result is increased speed, wider coverage, and improved reliability. It’s important to have a reasonable understanding of mesh network technology and hardware before jumping into this relatively new arena. Two years in and my OnHub is still being kept automatically up-to-date. I’m very pleased with the impressive speed and wide coverage of the OnHub/Google Wi-Fi family of routers.